Important Bird and Biodiversity Areas (IBAs) and Key Biodiversity Areas (KBAs) can be effectively used to set biological and investment priorities for conservation. This is well illustrated in the Eastern Afromontane Biodiversity Hotspot, where an investment of US$9.8 million (2012–2017) by the Critical Ecosystem Partnership Fund (CEPF) has been based on a conservation strategy that was largely guided by IBAs and KBAs. Another example is the development of the conservation strategy for the Great Lakes Region of East and Central Africa which has also used IBAs as one of the key tools for setting priorities, and investment for its implementation is being funded by the MacArthur Foundation. Birds have been used as a conservation tool in two major conservation strategies developed in Africa since 2010: the Eastern Afromontane biodiversity hotspot Ecosystem Profile (funded by the Critical Ecosystem Partnership Fund) and the conservation strategy for the Great Lakes Region of East and Central Africa (funded by the MacArthur Foundation). 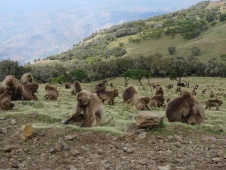 The starting point for defining Key Biodiversity Areas (KBAs) in the Eastern Afromontane hotspot (EAMH) was the existing network of Important Bird and Biodiversity Areas (IBAs). Data on other Red Listed taxa were added to this network to identify additional KBAs (sites hosting Globally Threatened Species or species which are irreplaceable on other criteria) within this hotspot. Bird species made up only 10% of the 677 species (those that are endangered or have restricted ranges) that were used to trigger KBA identification, but were responsible for the identification of 38% of the 310 KBAs that were recognised for the EAMH. These findings were compiled in an Ecosystem Profile for the hotspot that involved more than 200 individual stakeholders and 100 institutions, and that set out a five year investment strategy for biodiversity conservation action. A total of 9.8 million US dollars has been committed by the Critical Ecosystem Partnership Fund to implement the strategy between 2012 and 2017. IBAs were also core to the identification of KBAs within the Great Lakes Region (GLR) of East and Central Africa, leading to the addition of 73 terrestrial KBAs (based on birds alone) to those already found within the EAMH. These, together with an additional 68 freshwater KBAs and those KBAs already recognised for the EAMH, gave a total of 276 confirmed KBAs for the GLR. Bird species were responsible for the identification of 26% of the KBAs, despite making up only 9% of the 419 trigger species. A further 21 terrestrial and 51 freshwater sites were identified as candidate KBAs, on the basis of workshop inputs and expert desk reviews on the presence of other taxa. 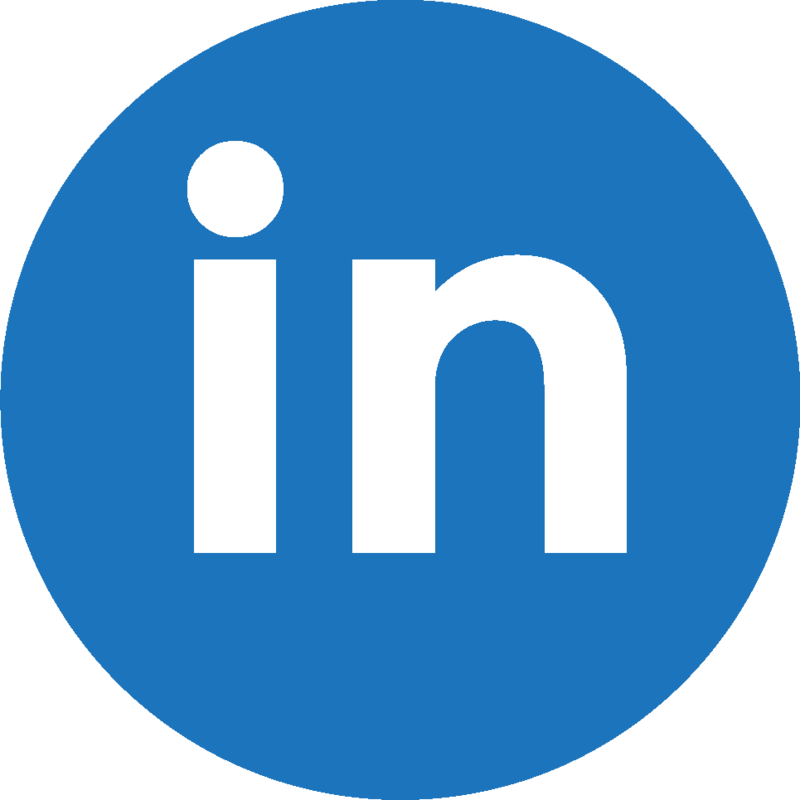 The strategy was designed around inputs from 29 experts from 11 institutions and 66 representatives at the workshops drawn from different government and non-government agencies, national and international organisations, donor agencies and research institutes from 11 African countries, Austria, the Netherlands, UK and the USA. The strategy emphasised the importance of understanding the links between KBAs and the provision of ecosystem services and to incorporate this understanding into policies and development planning. An investment of around 10 million US dollars is anticipated in the Great Lakes Region between 2013 and 2023. 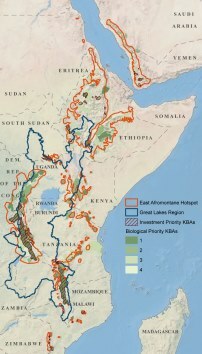 BirdLife International (2012) CEPF Eastern Afromontane Biodiversity Hotspot: ecosystem profile. BirdLife International (2013) Conservation Strategy for the Great Lakes Region of East and Central Africa.